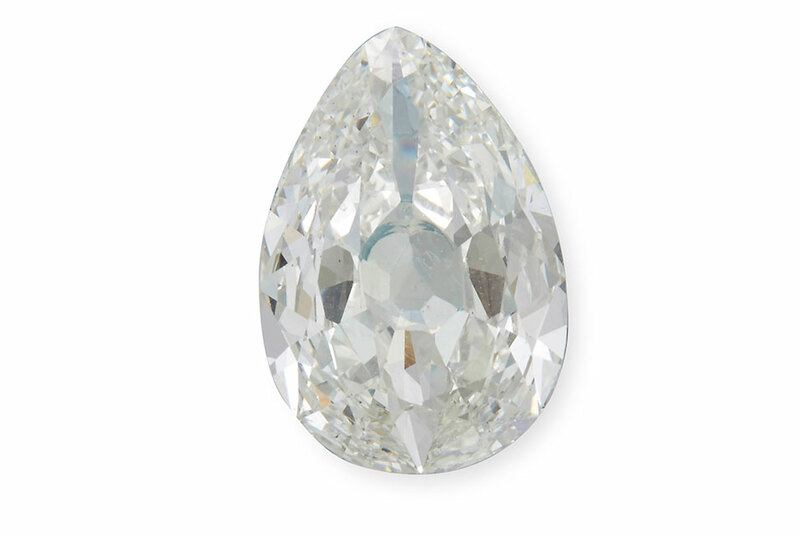 Lot 136, an impressive unmounted pear-shaped diamond, weighing 8.06 carats, far exceeded its presale estimate of $75,000-95,000, when it sold for $156,250. PHILADELPHIA, PA.- Tuesdays rain couldnt put a damper on Freemans autumn Fine Jewelry auction. When the final hammer fell, the sale totaled over $1.53 million, and enjoyed a 94% sell through by value. Diamonds of all shapes and colors dominated the days events. Highlights of the top lots include Lot 147, a rare fancy blue diamond, from a private Kansas City gentleman weighing 1.17 carats, which sold for $175,000. Lot 136, an impressive unmounted pear-shaped diamond, weighing 8.06 carats, far exceeded its presale estimate of $75,000-95,000, when it sold for $156,250. A pair of diamond, ruby, and platinum clip earrings, set with baguette and old European-cut diamonds (Lot 151), a pair of Burma Ruby and diamond earrings by Raymond Yard tripled their estimate, when they sold for $25,000. Two Art Deco diamond and platinum bracelets exceeded their estimates, as well: Lot 52, set with European-cut diamonds and square and rectangular-cut sapphires, sold for $23,750, and Lot 150, set with three marquise-cut diamonds and accented by calibre-cut emeralds, sold for $29,900, nearly doubling its low estimate. From a collection of a Philladelphia Lady, pieces by Americas Court Jeweler Seaman Schepps, known for his unique, bold designs, worn by the countrys most prominent society families, also performed well. Lot 118, iconic Rio design is a gem-set, diamond and 18 karat gold bracelet, set with citrine, pink tourmaline, and rose quartz, more than doubled its high estimate of $8,000-12,000, selling for $25,000. Lot 143, a rock crystal and eighteen karat gold Chessman bracelet, sold for $25,000, and Lot 144, rare jadeite jade, rock crystal, emerald and eighteen karat gold Snuff Bottle bracelet, sold for $21,250. All more than doubling their presale estimates. Freemans Fine Jewelry Department is currently preparing for its Holiday Sale, to be held November 28. The next Fine sale is tentatively scheduled for May 2019. Suitable consignments are invited until March.